1. An element of culture or system of behaviour passed from one individual to another by imitation or other-genetic means. 2. An image, video, piece of text, etc,; typically humorous in nature, that is copied and spread rapidly by Internet users, often with slight variations. It should come to surprise to no one that I spend a lot of time on the Internet. I spend 8 hours at work using the Internet and then come back home, eat dinner, spend time with my family, and then go back at it for another 2 hours to work on the website. That’s at a base minimum. 10 hours out of my 24 hours (41.67%) In that time, I’ve come across a fair number of memes. Heck, we even make memes on the odd occasion! They’re fun and light-hearted which makes me feel good when others like them. 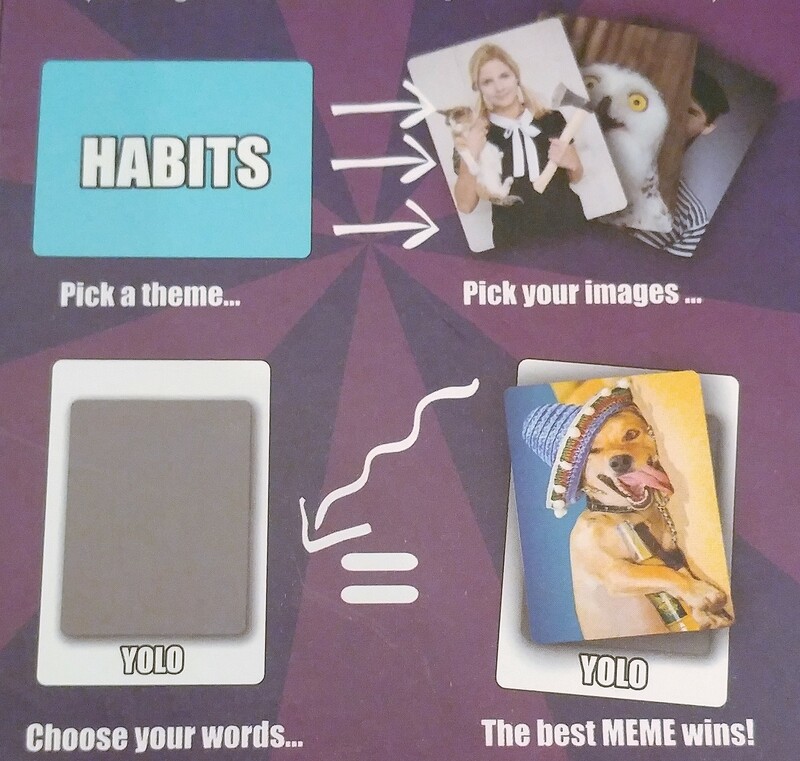 Imagine my delight when a card game came out that allowed you to play to see who had the best memes! When my good friends pulled out this game, I was positively giddy with the thought of destroying them with my previous meme-generation experience. The goal of the game is simple: make a meme that the judge will think is funny and relevant to the theme. Themes are decided upon by a random card deck in the middle of the table. 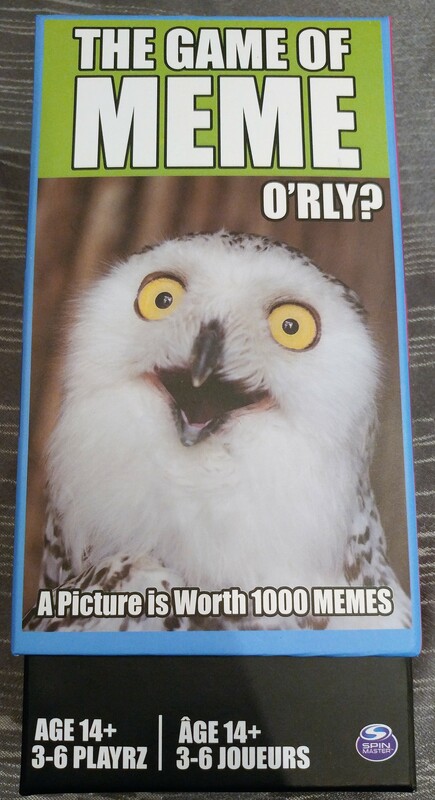 These memes consist of two types of cards – an external frame with text and pictures sized to fit within the middle of the frame. By presenting these two together, you compete with other meme-generators to win over the judge and claim the theme card. The first to 5 cards wins! The flow of the game is a little counter-intuitive for some players. The first part of the round includes a card management round where the player to the left of the judge picks up a picture card, chooses whether to pass it or another picture card on to the player to their left. The last player discards their picture card. The same is done with the frame cards in reverse (right to left). We started with this rule and with a vote of 2 to 1, it was changed. I would recommend this game for a quick game or as an alternative to a light game of Cards Against Humanity. It’s better with fellow Net-ophiles since they are more likely to understand the pairing, but previous knowledge is not necessary. For more information, ask your favourite gaming venue for The Game of Meme.